Bengal had been known through ages for its mastery in art and culture. How many of us are aware that, cosy, dark, humid studios located at Kumartoli, North Kolkata have consistently produced Michael Angelos and Leonardo Da Vincis’ through generations. 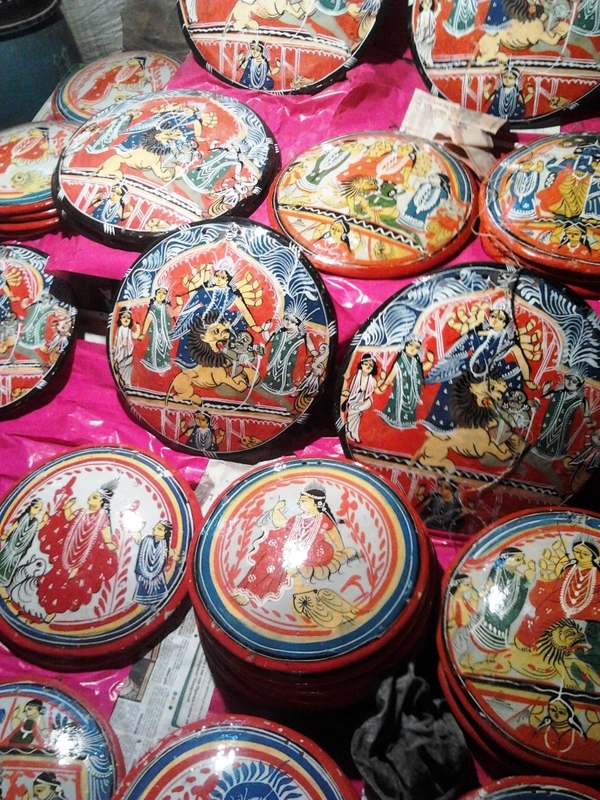 Kumartoli is popularly known in Kolkata as the “Potuya Para” meaning the localities for “Potuyas” or artists who are specialists for painting traditional Bengal art on earthen vessels and paper. These artists have not only championed this lost art through ages and generations but have also mastered earthen sculpturing of Hindu deities that are worshipped during festivals like Durga Puja. Millions of people throng to Puja Mandaps to witness the mastery of this popular art and devote their Pujas during the Durga Puja. Puja organizers are awarded on the basis of best “Idol”, best “mandap”, best “decoration” by professional organizations. 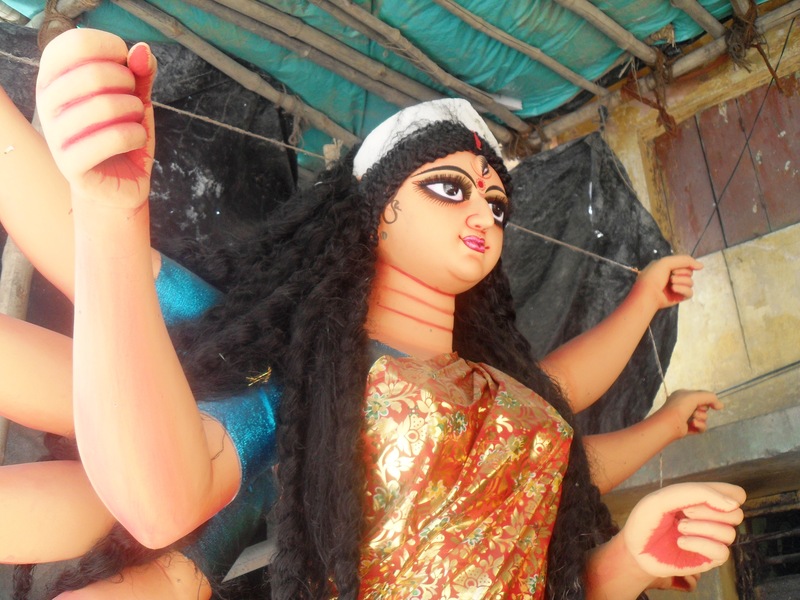 Over the years Kolkata and towns in Bengal have seen the sprout of untold competition among Puja organizers to scale up their Puja celebrations. Among these the role of Kumartoli’s Michael Angelos and Leonardo Da Vincis’ remain immense to keep up the expectations of the millions of people who wait for an entire year for the Puja festival. Kumartoli is a very popular locality in the busy North Kolkata. It is very near to Howrah Station. 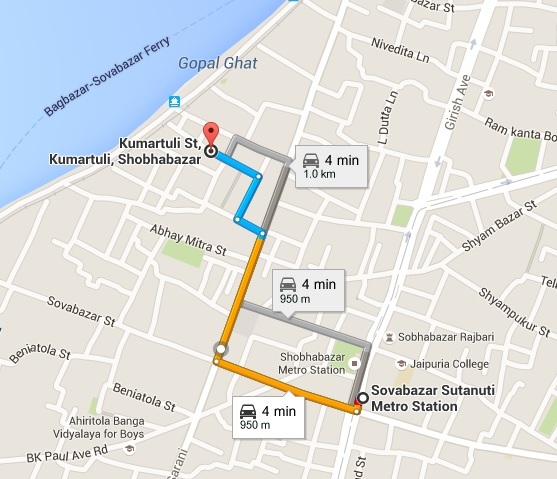 Apart from cabs, buses like 215A may drop one easily to the Kumartoli from Howrah station. 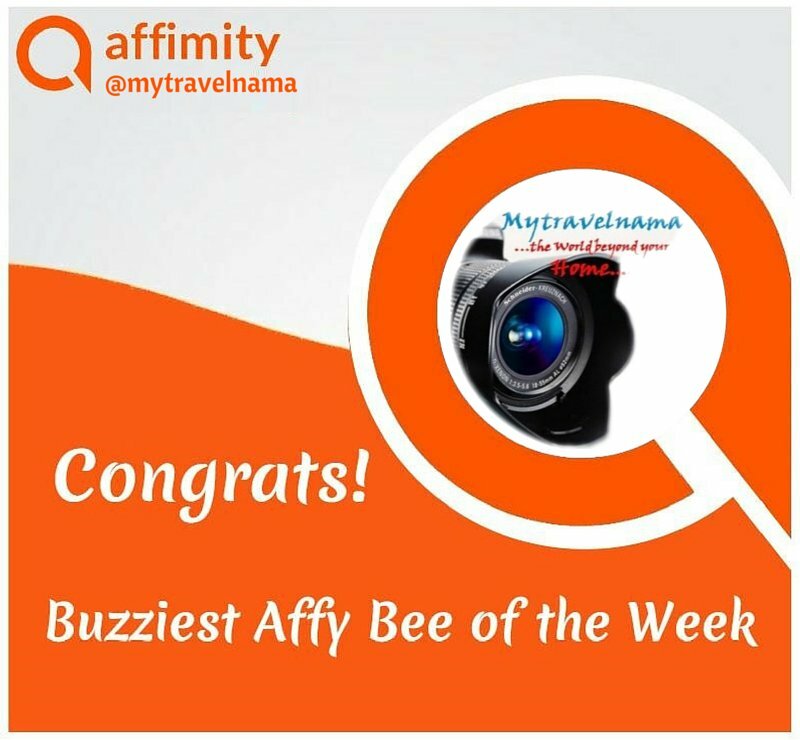 Taking the most popular mode of transport – the Kolkata Metro rail, one may drop in at the Shovabazar Sutanati Metro station and pick up an auto rickshaw to reach the busy streets of Kumartoli. 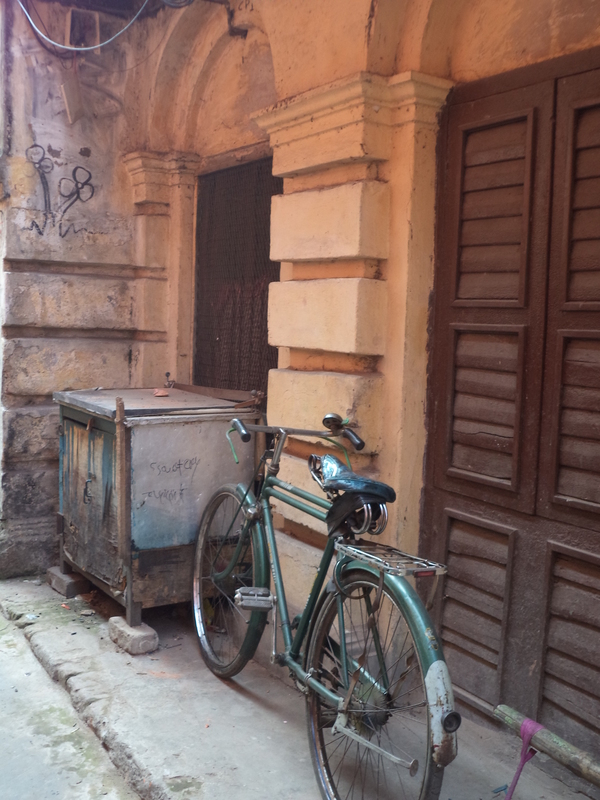 The locality gives a tourist the flavour of the ancient Kolkata way back beyond the colonial era. Kumartoli is not only famous for its world famous earthen-sculpture studios, it is the place which houses innumerable heritage buildings like the Jorashako Thakur Bari (famous for Rabindranath Tagore), Hathkhola Dutta Bari, Jorabagan Dutta Bari, Khelat Ghosh mansion etc in its vicinity. 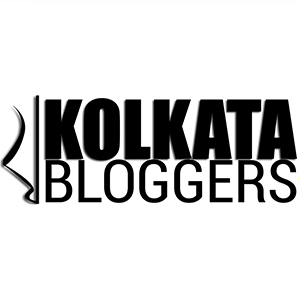 How can Bengalis ever forget Kumartoli, for housing the historical sweet meat shop of Navin Das who had first discovered “Rasogollas” the dearest Bengali sweets. The nostalgic tramway, the hand pulled rickshaws, the busy hawkers and the overcrowded footpath stalls create an adorable aura when one proceeds towards to the studios of Kumartoli. The studios of Kumartoli are mostly humble and simple. They are all erected on temporary structures made of bamboo, tinned walls and tiled roofs. Each lane into the studio locality houses the studios on both sides. From outside it is difficult to understand and scale how big each studio could be. 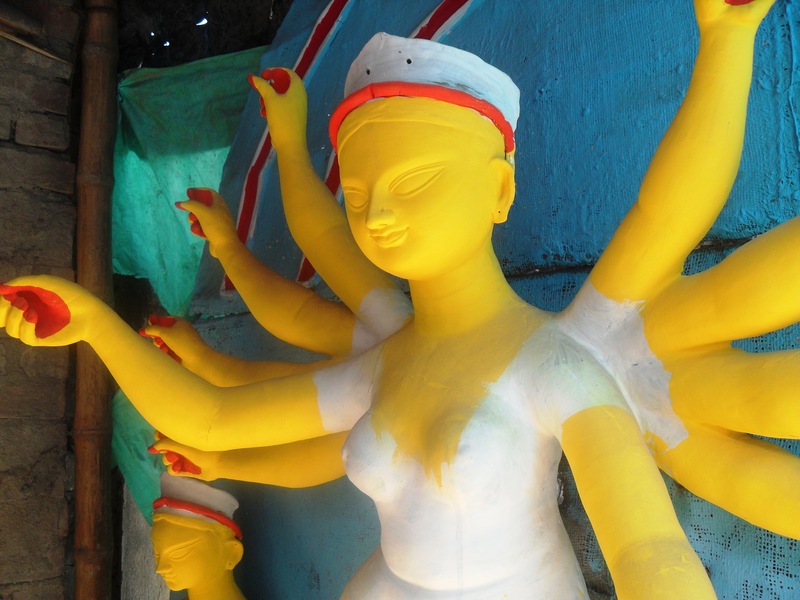 One such studio may house the space for hundreds of clay idols during the puja season. The artists include an entire family. 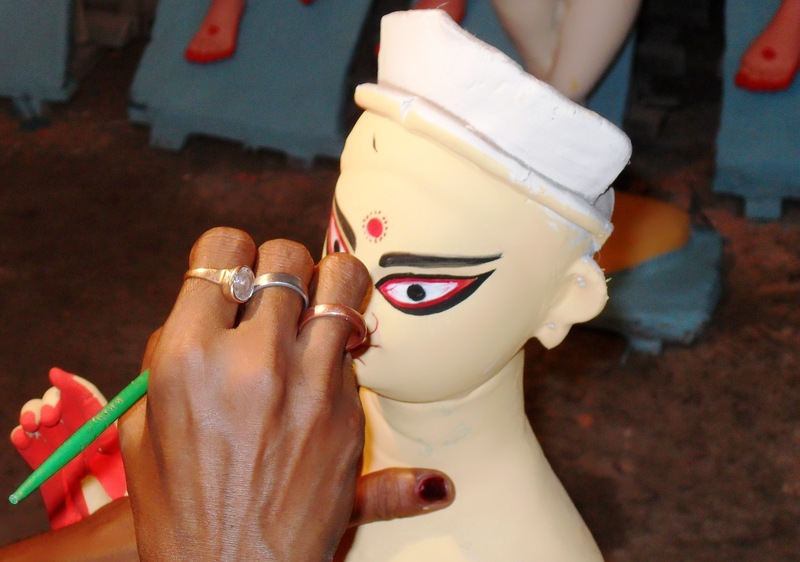 Apart from the elders, the ladies too pitch into various activities like taking care of maintaining the clay layers, drawing, painting, decorating and stitching the clothes worn by the finished idols. Even the younger ones have roles in fetching the bucket full of mixed clay-mounds to their parents standing on hand-made studio ladders & stools. The interesting fact about many of these artists is that many of the men are employed in various other professions, they take up clay-sculpturing during their leisure. Some even take long leaves during puja seasons in order to dedicate themselves to the studios. There are even many people here who have dedicated themselves fully to this art as their only profession. According to popular Bengali ritual, painting the eyes of the eyes of the Goddess (Netradan Ceremony) is an important religious practice. All the clay artists consider this activity as the most challenging and intriguing exercise of idol making. Kumartoli is well known in Kolkata for the Kumartoli Park Sarbajonin Durgotshob. The puja is famous for scaling up unique themes in its Puja Mandaps and decoration of the Divine Idol. 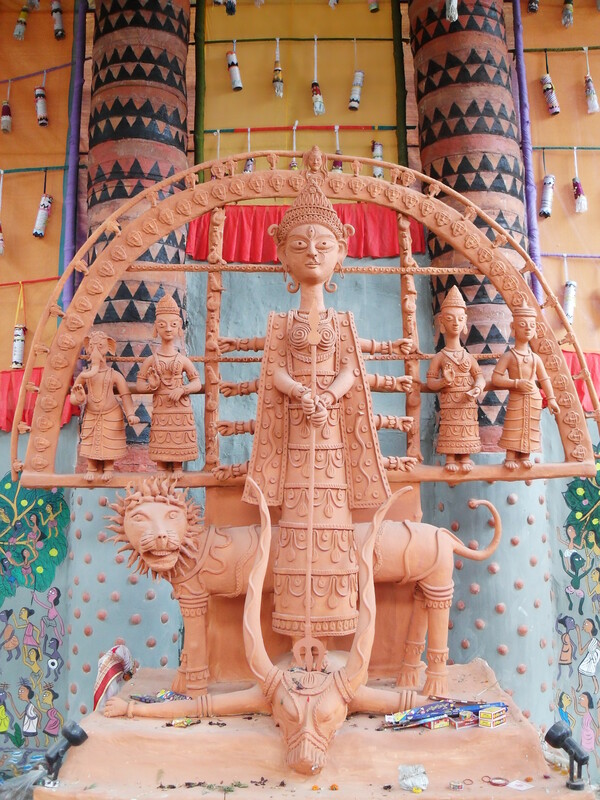 I am sharing a snap of Kumartoli’s 2011 Durga Puja which had acclaimed several “Sharod Samman Awards” for its terracotta theme. The streets of Kumartoli like other places in North Kolkata are famous for innumerable mouth watering fast food items. The hot samosas, kachori, jelabis, Bengali pakoras like Beguni, fuluri, aloor chop, mochar chop, fish cutlet, egg roll, kobiraji, moghlai paratha, chowmin are simply out of the world. Apart from these popular sweets like Rasogollas, mishti doi (Sweet Curd), Rabri, Roshomalai, sandesh, langcha, amritti, creamy lassis are available almost everywhere. 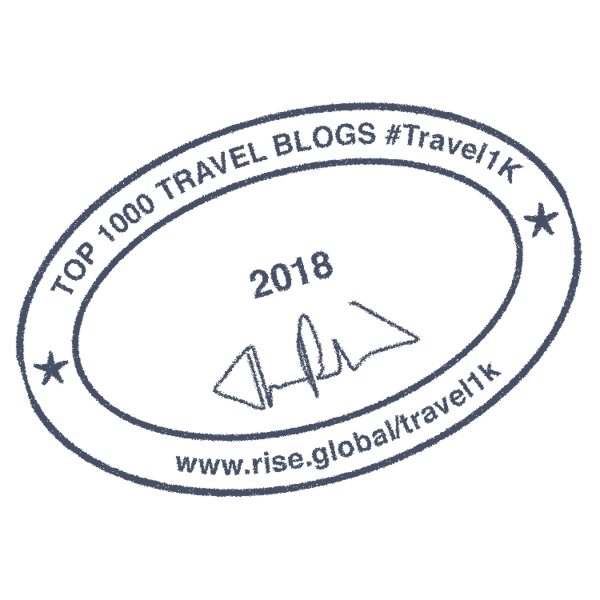 In addition to these popular chat items like foochkaas (Gol Gappa/Pani Poori), alu kabli, papri chat, vel poori, jhal moori are simply too good. 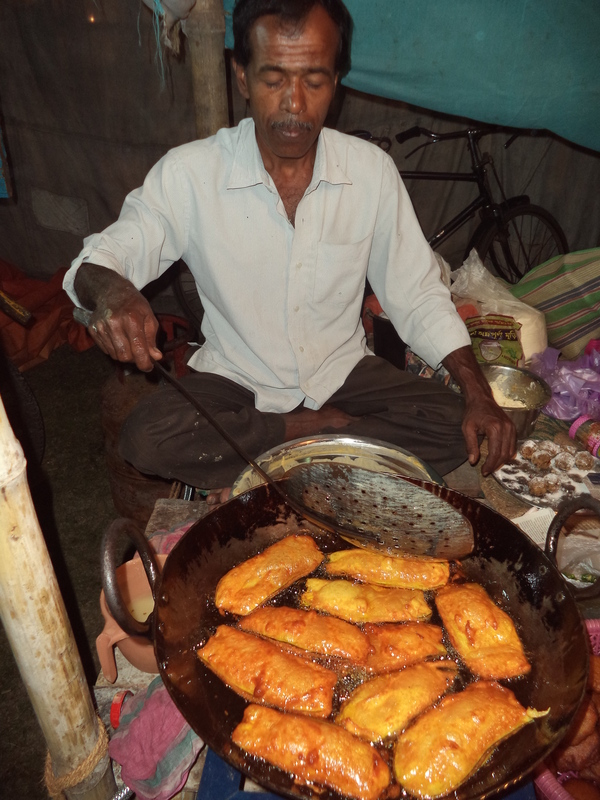 As a tourist one may definitely enjoy the traditional Bengali tea served hot in earthen vessels in a local tea stall. 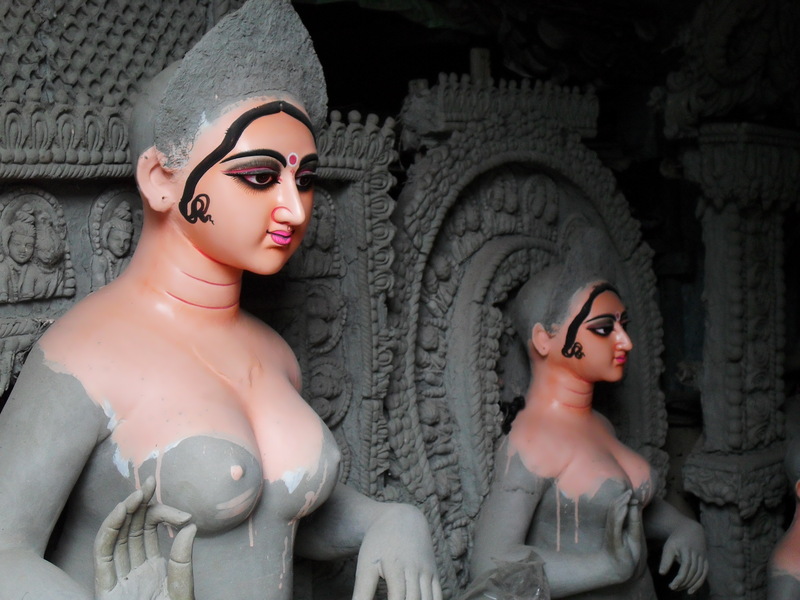 Although the clay studios of Kumartoli remain opened throughout the year, for a tourist the ideal time to visit is during the September/October – Pre Durga Puja months. Rathayatra festival (Lord Jagannath’s Rathayatra) which is celebrated during the July-August months ideally marks the beginning of Durga idol making which extends to September-October. 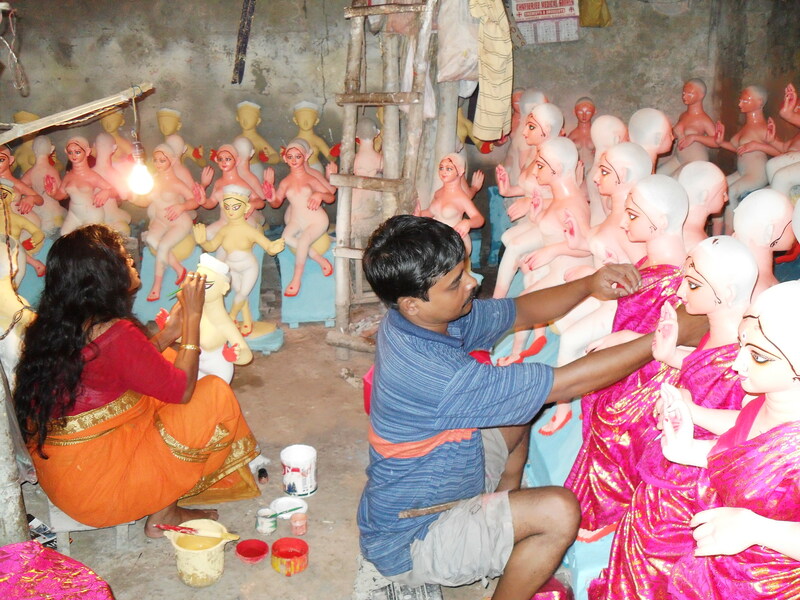 The clay artists of Kumartoli have an extended busy schedule post Puja festival for Lakshmi Puja, Kali Puja and Jagadhatri Pujas which closely follow the Durga Puja.